Religions are mesmerised and ruined by power but always pregnant with the possibility of humility. They are so easy to ignore. You'd be wise to sneer, with every reason imaginable for the curl of your knowing lip. Yet here I am, on Sunday morning, in the wedding reception tent, agog; not so much at the earnest idiot of a minister, but at everyone, sweetly, else. 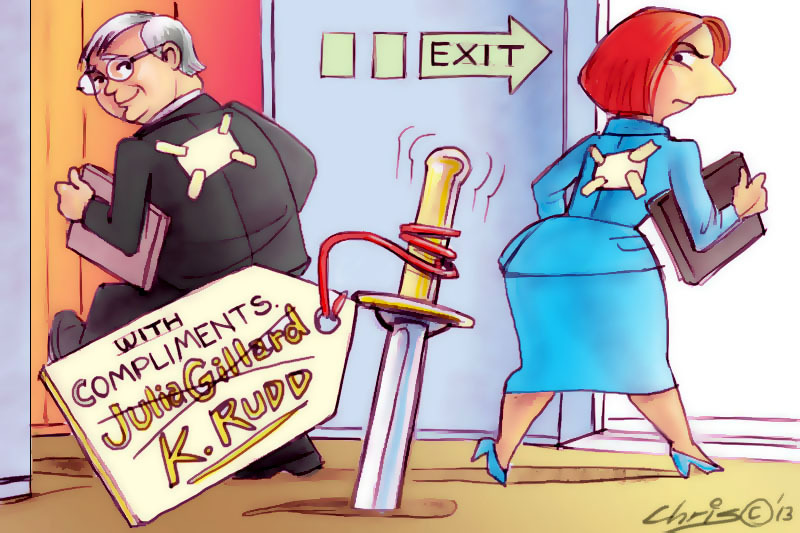 One of Kevin Rudd's key points of difference with Julia Gillard lies in his determination to project a business-friendly image for himself and the ALP. This may have something to do with his decision to dump former parliamentary secretary Andrew Leigh, who is Australia's leading inequality expert and clearly unsympathetic to the demands of big business on government. There is no balm for the yearning of eucalypts. Candlebarks stretch up this vaulted wanting. Dahlias splash an insane chant over a paddock, a calf nods and backs into a startled wander. One day she might raspily lick the mystery of my supplicant salty palm.